Is Secondhand OK for Baby? Parents are as varied as the infants they bring home. When I was pregnant, I shopped thrift stores, the Goodwill, the Salvation Army and thousands of yard sales in an effort to fill baby’s room with furniture and clothes without breaking the bank. Not all parents agree with buying hand-me-downs for a new baby – is secondhand OK for baby? Secondhand or used baby furniture is a huge money-saver, but there are a few safety rules you should follow. Cribs should meet current safety standards. Crib slats should be no more than six cm apart and the space between the crib mattress and sides of the crib should be less than two fingers. Tight mattresses are the best – it may even feel like you have to stuff the mattress into the frame. Side rails must be fixed, not moveable, according to new safety guidelines. 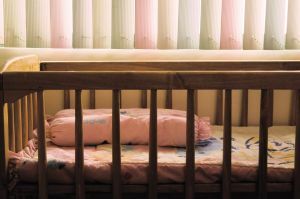 The Consumer Product Safety Commission suggests using cribs less than 10 years old. Changing tables need to be sturdy and provide a guardrail for infants. Experts suggest a guardrail no shorter than five cm around the entire changing surface. A safety strap should be attached to the table to hold baby in place while changing. Most secondhand clothing is completely safe for new babies. Wash all clothing in mild, baby-friendly detergent before using. Clorox bleach is safe for infant clothing, but only use the suggested amount as using too much bleach can cause clothing to carry an overwhelming scent. Cloth diapers can also be purchased secondhand, but should be washed in hot water and bleached prior to use. Always wash cloth diapers separately from other clothing. If your washing machine has a sanitize setting, use this setting for cloth diapers prior to first use and with each wash.
Secondhand items are completely safe for baby and an effective means of saving money. Always check the Consumer Products Safety Commission for current recalls on furniture and toys before purchasing.